The first in a series of bipartisan conversations across California is set for San Jose on August 19. A group of civic leaders—including three recent statewide candidates—believe the public is ready to talk about how we spend our money, how we improve our schools and how we create meaningful jobs. We’d like to see you there for what we believe will be an interactive and informative evening. (Here’s how you register). And it’s free! Leading the conversation will be Pete Peterson, executive director of Davenport Institute for Public Engagement and Civic Leadership, Chuck Reed, former mayor of San Jose, Ashley Swearengin, mayor of Fresno and Marshall Tuck, Educator in Residence, New Teacher Center. But the key to the session will be audience participation. CA Fwd Co-Chair Pete Weber wrote about the idea in a thoughtful blog last month. He emphasized that securing and sustaining community vitality will require vision and diligence on the part of public leaders, and meaningful involvement on the part of the public. CA Fwd has been asking each of the lead participants why they are taking time from their busy lives to discuss these big, complex challenges. 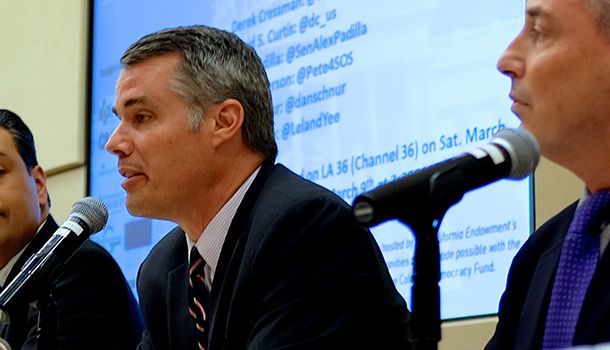 Pete Peterson, who ran as a candidate for California Secretary of State last November, shared his thoughts in a recent interview. CA Fwd: Why did you agree to participate in these "bipartisan" conversations? CA Fwd: Who do you hope will participate? CA Fwd: A lot of stories on California politics play up a fight between groups. Can California become a model for collaboration? How can that happen? CA Fwd: Seems like one area of concern or emphasis is how we get more people paying attention to participating in the electoral process--How can we improve that? CA Fwd: Of the other issues you expect to discuss in addition to increasing public participation--issues like having the triple bottom line approach to job creation, the state's fiscal sustainability and government accountability--we tend to look at the issues separately. How are they all connected? CA Fwd: What do you think should/can come out of these conversations? The August 19 event in San Jose takes place from 5:45 p.m. to 7:45 p.m. at the Martin Luther King Library on the San Jose State University campus. More information and registration here. The second event is scheduled for September 29 in Clovis in California’s Central Valley from 6 p.m. to 8 p.m. at the Center for Advanced Research Technology. More information and registration here. We’ll let you know as other events are scheduled across California. CA Fwd is proud to be supporting the series.